Orale! 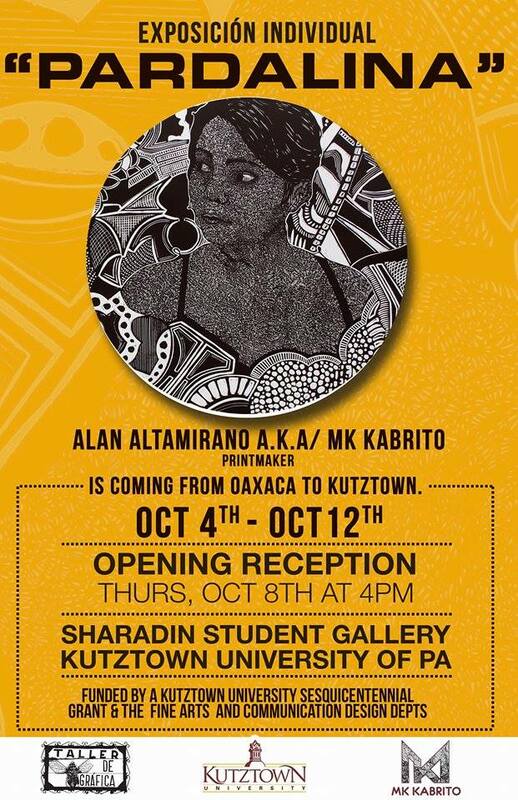 Alan Altamirano esta en Kutztown. Alan Altamirano makes art about women, beautiful women. 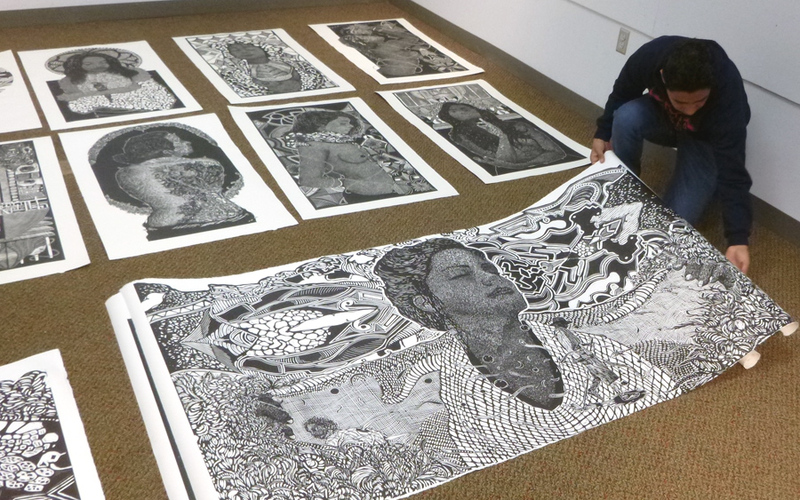 The 27-year old artist is from Oaxaca, Mexico, a city famed for its food and visual arts. Like many of the best Oaxacan artists of his generation he studied with Maestro Shinzaburo Takeda at the School of Fine Arts at the University of Benito Juarez, Oaxaca. Prof. Evan Summer admires a portfolio of etchings. Today I spent the day with Alan hanging his large-scale wood block prints in the Student Gallery in Sharadin. 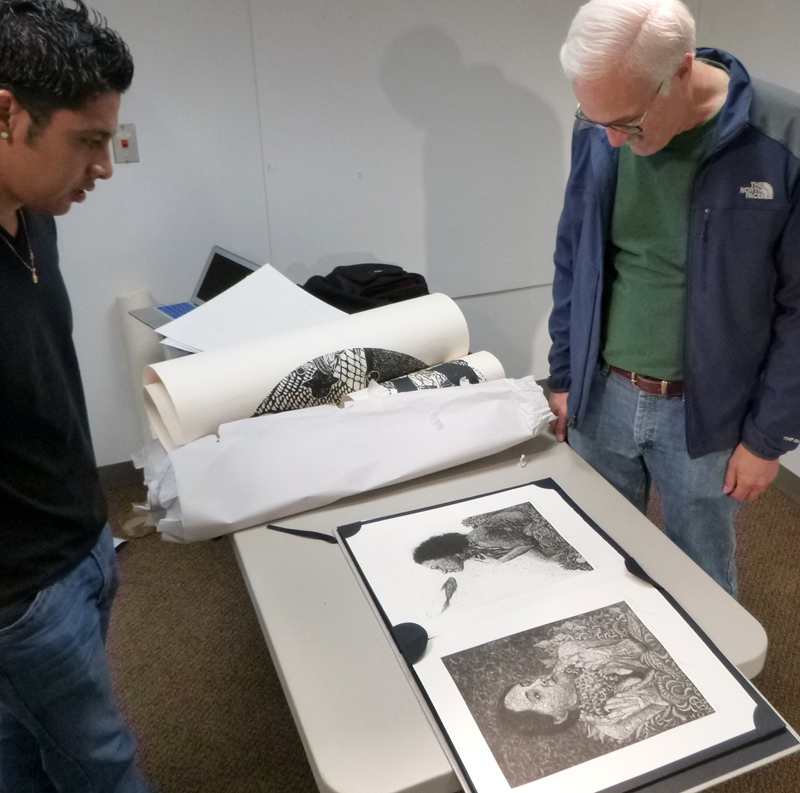 When printmaking Prof. Evan Summer visited, Alan shared a portfolio of etchings based on indigenous Zapotec cosmology. Even these etchings portrayed the cardinal elements: Earth, Wind, Water, and Fire as women. 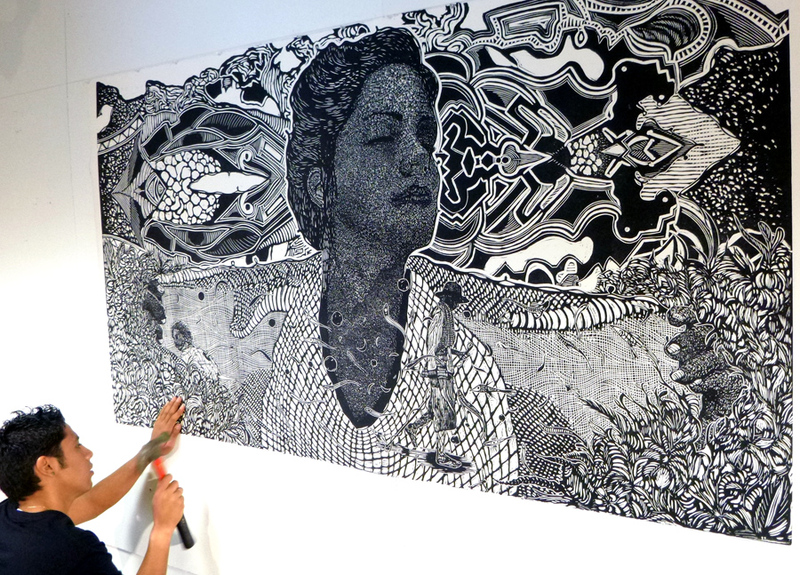 One of Alan Altamirano’s grand-scale relief prints. Some of his models he has known for years. Others Alan met for as little as an hour. In many portraits he includes decorative geometry and elements from nature. The image above is of a Puerto Rican woman he met who told Alan about her memory of her beloved uncle. Her uncle, a fisherman, was swept away at sea and drowned. The drowned man appears to her left. Another male figure, the barefoot campesino, walking across the foreground represents her father. This artwork is a stunning example of relief printing, or xilographia, as it is called in Spanish. Here, Alan carved the image not into wood, but MDF, or multi-density fiberboard. Alan Altamirano’s extraordinary prints will be on display in Sharadin October 6-12, with an artist’s reception at 4pm on Thursday, Oct. 8. This is remarkable work. He will be on campus the following week meeting with interested students. The exhibition and his 2-week residency at Kutztown is funded by the Fine Art and Communication Design Depts. and a generous grant from the Kutztown University Sesquicentennial Committee. Kutztown students have a unique opportunity to study with Alan in Oaxaca as part of Kevin McCloskey’s Winterterm course. Alan invites visiting artists to work in his studio. 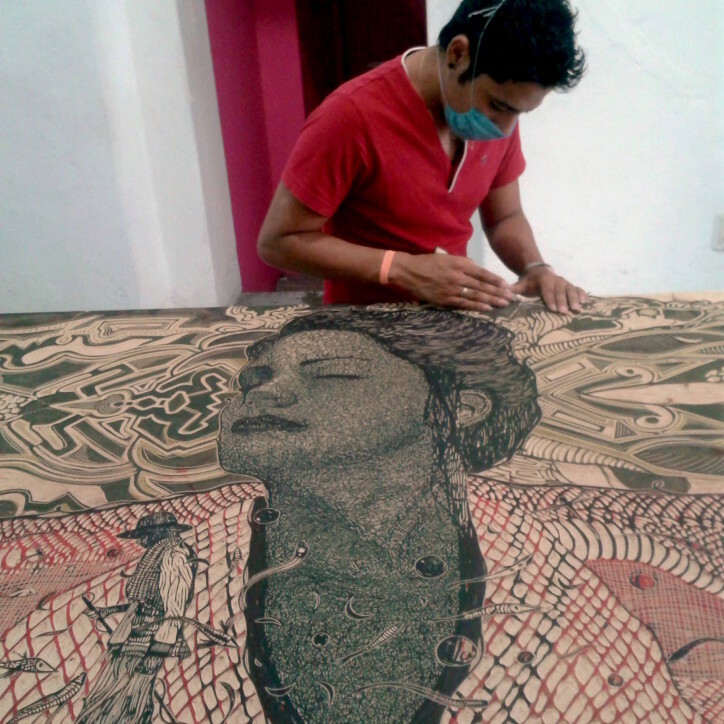 He also offers frequent workshops for printmakers at any level at his Taller Chicharra. See Norma Shafer’s Oaxaca Cultural Navigator for more images from his studio.